Synopsis: A couple’s relationship is tested when uninvited guests arrive at their home, disrupting their tranquil existence. 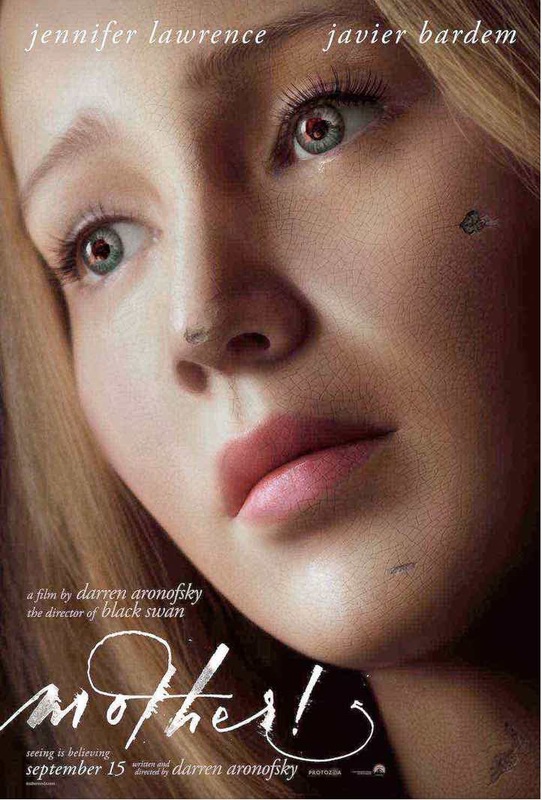 Review: I truly wanted to like mother!…I did. In the weeks leading up to the screening I literally counted the days until it arrived, and if I’m honest it was more for the chance to see Michelle Pfeiffer up on the big screen again. Still…maybe I set a bar so high that no final product that Darren Aronofsky (Noah) could have delivered would have made the grade. Then again, the movie winds up being so vile, so grossly arrogant, and with its head so far up its own backside that it’s hard to believe anyone could leave a showing of mother! better off than when they arrived. No sooner do the lights go down than the image of a woman bathed in flames appears. A single tear rolls down her cheek and by the end we’ll want to cry too as Aronofsky lays everything on thick for Act 1 of this nightmare. Not much can be revealed about mother! without leaking several key twists but if you’ve seen the trailer for the movie you’ll get a pretty good taste for what the first half of the movie has to offer. A young woman (Jennifer Lawrence, Joy) is fixing up her older husband’s childhood home years after it was gutted by a fire. Without asking her, the husband (Javier Bardem, Skyfall), a famous poet with writers block, welcomes a stranger (Ed Harris, The Abyss) and his wife (Pfeiffer, Dark Shadows) into their house and that opens the door for a bevy of visitors with their own inexplicable agendas. Even before Harris arrives, the relationship between Lawrence and Bardem is so awkward you’re already curious what kind of power he has over her. She allows him to make all the decisions, rarely challenges him, and barely raises an eyebrow when he doesn’t seem to notice that the visitors are odd with a capital O. For a while, mother! hums along with a decent amount of atmosphere and head scratching developments that Aronofsky somehow manages to stay one step ahead of. Lawrence plays the role with such wide-eyed growing dread that I half wonder if she was fed her scenes one at a time and didn’t know where it was all heading. Bardem sure seems to know, though, and he starts to gnaw on the scenery in no time flat which puts him in a plum position as the film reaches its zenith about 75 minutes in. From there it quickly descends into a delirious mess and while it gets advanced brownie points for its boldness it loses them in the same breath for going to such an abysmally rank place in its finale. I was a bit appalled to tell you the truth, not so much for one seriously gory stomach churning curveball but for extended scenes of violence toward Lawrence that just felt so wrong. Aronofksy and Lawrence are a well-publicized power couple in Hollywood and if this is the kind of movie Aronofsky writes and directs for someone he loves, I can’t even imagine what he’d do for someone he can’t stand. A snuff film, maybe? His previous works are just as divisive as mother! is sure to be but, save for Requiem for a Dream which even he couldn’t top for sheer Grand Guignol chutzpah, at the end of the day the final message he’s delivering doesn’t seem wholly original or meaningful. In past movies, he’s tackled drug abuse, man’s inhumanity to man, and paralyzing ambition…here he’s trying to speak to everyone on the planet and the reach is too much. Like Natalie Portman in Aronofksy’s brilliant Black Swan, Lawrence is in nearly every frame of the movie and she’s well cast in a terrible role. Why she doesn’t just pack her bag and head out the door each time her husband does something looney tunes is maybe the biggest mystery of the entire film. When she does decide to head for the hills, she’s pregnant and her house is being invaded by hordes of people (including Kristin Wiig, The Martian, who pops up in the briefest and strangest of cameos billed as ‘the herald’) who are there for her husband. You’ll be surprised to find out just how little Harris and Pfeiffer are in the movie…and more’s the pity because what the final half of the movie needed is the spark Pfeiffer brings to each of her scenes that are front-loaded into the first hour of the film. Always a favorite of mine, Pfeiffer is gleefully loosey-goosey as a gin-soaked annoyance who pushes Lawrence’s buttons with delight. She’s rarely been this relaxed in the last decade of her career and while it isn’t the Oscar-winning performance the studio is gunning for, she’s the best thing about the movie by a longshot. With dizzying camerawork by Iron Man’s Matthew Libatique (seriously, bring a barf bag) and a purposefully irritating sound design, the technical elements are sharp as a tack in true Aronofsky style. The sound is so specific by making sure you hear each floorboard creak and droplet of water falling in a copper sink that there are times when I swear you can hear the actors blink. A little of that goes a long way and by the finale when all hell is breaking loose (literally) it becomes an overwhelming cacophony of visuals and sound that you’ll be desperate to break free of. While I just can’t bring myself in good faith to endorse this one, if anything, mother! will be a fun movie to dissect over drinks after…but take my advice and steer clear of food before, during, and after. While there was potential for something interesting to take shape with the strong elements Aronofsky has assembled, at the end of it all I just wanted my mother…to give the director a good whack upside the head. The Silver Bullet ~ mother! Thoughts: Oh let’s just face facts, they had me at Michelle Pfeiffer. It’s always a special joy to see Pfeiffer (Grease 2) onscreen at any time and we’re fortunate that she’s popping up in so many places in 2017. Before she boards Murder on the Orient Express in November, she’s going to be seen in Darren Aronofsky’s strange little thriller mother! (no capital letters for this guy!) this September. This looks like it’s either going to be a nasty little nightmare that Aronofsky is so good at or a total mess which would be pretty unfortunate considering the stellar cast assembled. I wince a bit at 27 year old Jennifer Lawrence (American Hustle) married to 48 year old Javier Bardem (Skyfall) but let’s hope Aronofsky offers an explanation within the first reel. Ed Harris (The Abyss) also stars but it’s Pfeiffer looking snazzy and sinister that seals this deal for me.